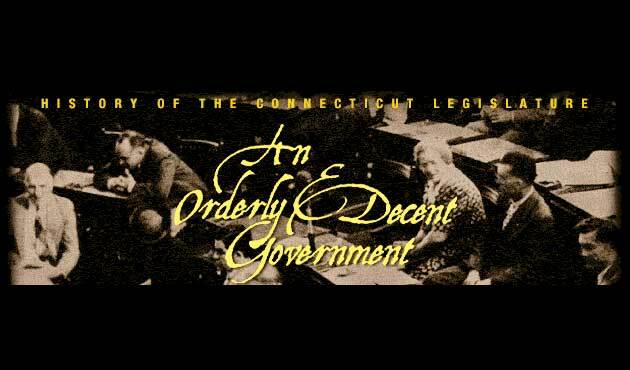 In 1873, the legislature began to look more closely at the problems of Connecticut’s workers and established the Bureau of Labor Statistics to collect data on employment and wages. 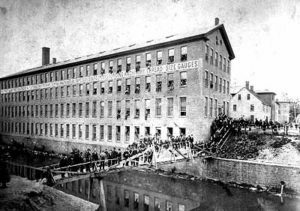 Representative Stephen Walkley, a member of the Select Committee to Revise the Pauper Laws, was part owner of several large factories in his hometown of Southington. Made up entirely of farmers, small businessmen and industrialists, the committee recommended that the unemployed asking for food must work for it or face jail. The General Assembly attempted to deal with unemployment by voting to expand the state’s almshouses and placing the jobless in institutions. 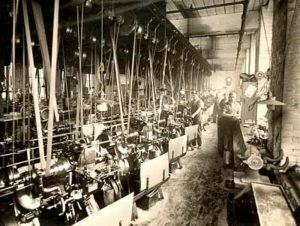 Textile mills were the state’s largest employer of children, who comprised over 20 percent of the cotton-mill workforce in 1880. Organized labor sought to end these conditions. In 1885, the Knights of Labor elected 37 members to the General Assembly. Rejecting the protests of employers, the 1886 legislature banned employment of children under 13 years old. The law worked: between 1880 and 1890 the percentage of children in the industrial workforce declined from 8 percent to 2 percent. Shafting, belts, and pulleys posed constant dangers to inattentive workers in 19th-century factories. In 1887, the General Assembly passed a factory safety law but failed to provide adequate means for enforcement.